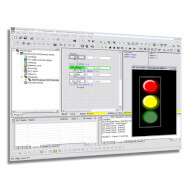 CX-Supervisor boasts powerful functions for a wide range of PC based HMI requirements. 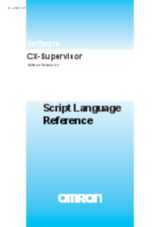 Simple applications can be created rapidly with the aid of a large number of predefined functions and libraries, and even very complex applications can be generated with a powerful programming language or VBScript™. 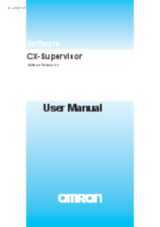 CX-Supervisor has an extremely simple, intuitive handling and high user friendliness. 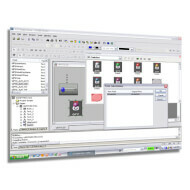 Importing ActiveX® components makes it possible to create flexible applications and extend functionality. 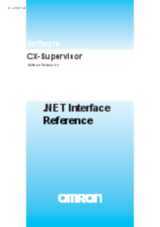 CX-Supervisor is dedicated to the design and operation of PC visualisation and machine control. It is not only simple to use for small supervisory and control tasks, but it also offers a wealth of power for the design of the most sophisticated applications. The Graphics Library has been significantly improved to include new ’Smart Objects’ which allow objects to include actions, animations and associated points. 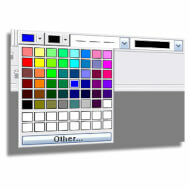 Make your own library of re-usable objects for your machines and use again and again. A consistent look & feel between your NS panels and CX-Supervisor is now possible as v3 includes the graphics library from CX-Designer. Support is now added for JPEG and GIF allowing you to choose the image you wish to use and now you have the option to make part of an image transparent. 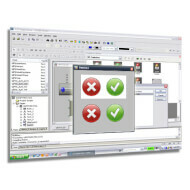 Metafiles can be converted into CX-Supervisor objects and modified to suit the application or added to the graphics library complete with special animations and actions. Integrated One Click Simulation now comes to CX-Supervisor after its popularity in CX-One. 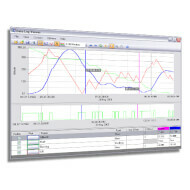 This enables your application to be tested using a simulation of the PLC without having to deploy to a runtime machine – all with a single click operation. The CX-Supervisor developer package also now includes a trial runtime, so there is no need for a USB dongle to test your application. Web Based Remote Maintenance allows a user to remotely and securely log in to view and edit points, monitor and acknowledge alarms and logs and update the application all with a standard web browser from anywhere in the world! Support for FINS Gateway allows you to directly access your devices using FINs Gateway 2003 (now included with CX-Supervisor) where the features of FINs Gateway better suit your communications needs. New heartbeat monitoring all of your device connections quickly informs you of problems. .NET Remote Interface allows advanced users to develop their own application and interact with your CX-Supervisor application. Plus much more including improved application analysis and performance monitor and a new 16 million colour palette control. Tässä osassa verkkosivustoamme voit rekisteröidä Omron-ohjelmistotuotteesi. Lisenssinumeron rekisteröinnin jälkeen pääset tarkastelemaan ohjelmiston päivitys- ja tukitiedostoja. Sen lisäksi näiltä sivuilta voi ladata useita ohjelmistosovelluksia ja työkaluja ilmaiseksi.